AIMSSEC understands the context of teaching and learning of mathematics in primary and secondary schools. 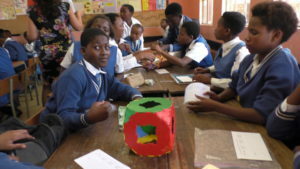 Interacting with teachers and learners in the classroom is an essential component of AIMSSEC’s public engagement in schools. From 16 – 19 May 2016, AIMSSEC staff visited five schools in the East London district of the Eastern Cape Department of Education. What is the role of the school leadership regarding improving the quality of teaching and learning of mathematics? How do parents and learners feel about mathematics as a subject at school? How could AIMSSEC support the school with further professional development of mathematics teachers? How do teachers collaborate with each other in schools and amongst schools to support professional development? Would teachers benefit from professional development in their schools by AIMSSEC lecturers working with the learners in the classroom? The schools visited include Nompumelelo Primary, Lujiza Primary, Nkangeleko Intermediate, Qaqamba Secondary and Byletts Secondary Schools.